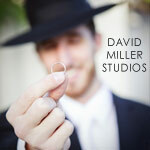 David Miller Studios is a Los Angeles based studio specializing in stylistic portrait and event images on your wedding day. Get more for your wedding! Don't forget to mention ChossonKallah.com when visiting David Miller Studios.